Your kitchen is the heart and soul of your home – and where you’re likely to spend a good proportion of your time. A well-designed, on-trend space can set the scene for your entire house – but keeping up with the latest kitchen trends can be exhausting and costly. Staying relevant without being in constant renovation mode is easier than you think. 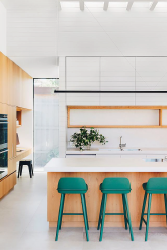 A modern kitchen can be easily updated to reflect the latest trends with judicial use of colour so Zip Water put together their top 2019 looks to incorporate into your kitchen, so you can stay ahead of the curve without the overhaul. Thanks to our love of all things Scandi, grey is on-point right now in minimalist kitchens. It looks particularly clean and elegant when paired with crisp white and wooden accents. 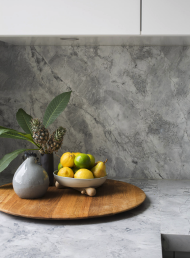 If you don’t want to renovate the entire kitchen, you could make a strong statement by replacing splashbacks and benchtops with marble, concrete or porcelain in grey hues. Still a little more renovating than you’d like to undertake? Try a dark grey mirror, a selection of grey ceramic vases grouped artfully or grey pendant lighting to get the look without the refit. This look is all about pairing warm wood tones with a bold accent colour. Start with light wood and neutral hues to get that breezy Scandinavian feel, then bring in some greenery from the garden to ramp up the natural vibe. Then choose an accent colour as a strong counterpoint to draw the eye and add interest – but keep the focus on natural hues. Emerald green, sky blue, sunset coral and bright yellow work well for statement walls, feature appliances, chairs or tabletops. Leaf green dining settings, glasses, tea towels and placemats also provide a jolt of colour without breaking the bank. This year we’ve seen a move away from the all-white kitchen in preference to darker colours like navy, charcoal and olive. It’s grown-up chic and works well with a range of home styles – but you don’t need to go entirely to the dark side to get the look. Changing your hardware, rangehoods and tapware can be a stunning way to add bold colour without going overboard. A Zip HydroTap in the Matte Black finish looks impressive with a moody blue splashback or bring in brooding blooms in deep purple, blood-red and dark green foliage for an instant dose of dark romance. Rose gold and blush tones are still in the interiors race, adding an elegant warmth to stark white. Combine fashion and function with the Zip HydroTap Elite in Brushed Rose Gold, perfect with matching saucepans displayed above the stove. For an easy makeover, try rose gold cutlery, ceramics and utensils, guaranteed to make every meal feel fabulously luxe. Add a sweet posy in blush hues for a pink pop to a beautiful table.